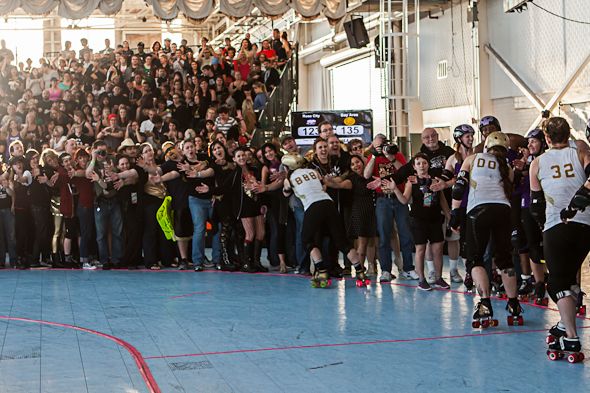 Since the top two teams at the Women’s Flat Track Derby Association West Region Tournament automatically advance to the national tournament in Atlanta, the third place game between the Bay Area Derby Girls and the Rose City Rollers was probably the most dramatic of the tournament. The bout was especially exciting since the BAD Girls hosted this year’s West Region Tournament. The bout was close the entire game (though not as close as the seventh place game) and there were very few two minute jams. (To those who have not watched roller derby, there were not many penalties nor big scoring plays… a lot of field goals.) The home crowd was excited to be returning to nationals. Portland fans are cool too.